Recommendations, right? Everyone is doing them and website visitors have learned to expect them. For example, recommendations for similar products on a product page or for complimentary products in the shopping cart are already an integral part of the user experience of a webshop. Black-boxing: Most recommendation engines won’t let you see the algorithms behind recommendations, let alone modify them. Data silos: Data from recommendation engines can’t be used in other systems, or the recommendation engine itself can only read very specific types of data. Cold-start problem: You don’t have enough data yet about the visitor, so there is no way to personalize recommendations. Irrelevant recommendations: Due to lag or other restrictions between systems, the data used for recommendations is not up to date. Therefore, the visitors may see recommendations for products they’ve already purchased or products in the wrong price range or category. The following tips help you work around these pain points and, hopefully, give you some new ideas for making the most of your recommendations. When selecting a recommendation engine, remember that one size doesn’t fit all. You are the expert on your webshop, your products, and your visitors. 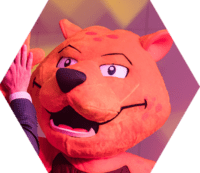 Therefore, you must be able to select and modify your recommendation algorithms so that they provide the best return on investment for your site. If you have an AI model in use, make the most of it by connecting it to your recommendation engine. Like conversion optimization and web UI development in general, using recommendations is an ongoing project. You must constantly fine-tune your algorithms and continuously test to find the best content, placement, and look and feel for your recommendations. Nielsen Norman Group recently carried out a study looking into visitors’ expectations and preferences for recommendations. They found that visitors rely heavily on recommendations to direct them to content or products relevant to them and that visitors highly appreciate personalized recommendations. It’s also important for visitors to know which content is personalized. 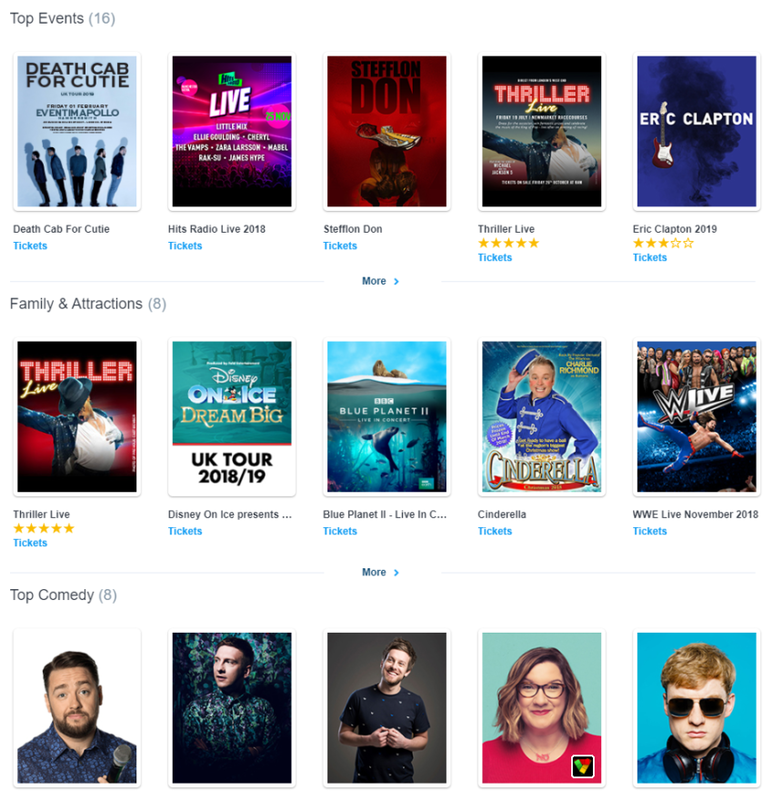 For example, if you have several recommendation carousels on the front page of your site (“New Arrivals”, “Best Sellers”, “Top Rated”, and so on), make sure that personalized recommendations are high enough on the page and really stand out (“Recommended for You”). If it feels natural, you can also state what the data source for a specific recommendation is. 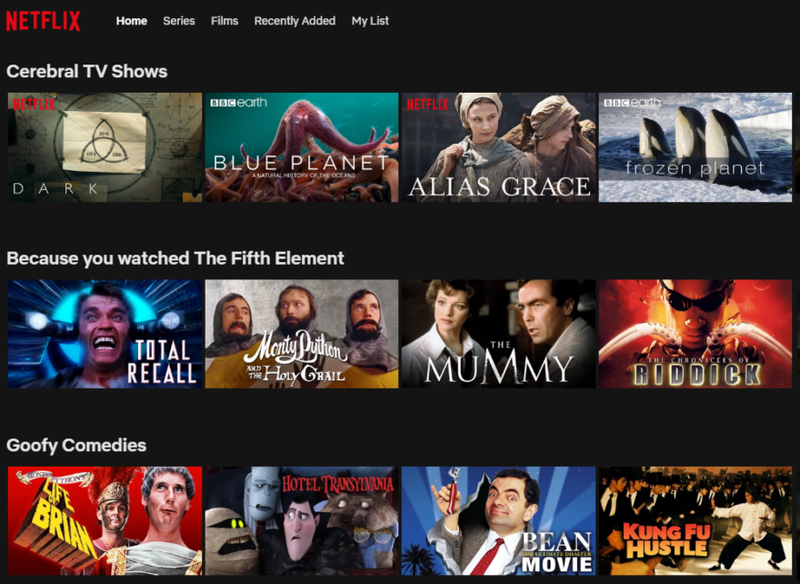 For example, Netflix has a UI based on content categories with recommendations (“Because you watched Black Mirror”) clearly standing out. Netflix clearly states that it recommends specific titles based on other titles you have watched. As we’ve established, recommendation engines normally rely on visitor data collected from the site, that is, personalization. Therefore, an engine’s performance suffers greatly when there isn’t enough data available, or a visitor hasn’t given information about their preferences. This problem occurs when the visitor is new to the site, but also when the visitor has defined their privacy settings so that collecting behavior data is not allowed. You can still recommend personalized content for these visitor groups. For example, natural language processing (NLP) can be used as a basis for an algorithm that recognizes words in the site content and makes recommendations based on similarities. If new visitors read an article about a specific topic, the algorithm recognizes the relevant keywords and crawls other articles to find the same keywords. Other similar articles are then recommended to the visitor. You can apply the same logic to purchasable products as well. Use an algorithm that recognizes similarities in textual product data (such as brand, description, or category) that you can use to recommend similar products. 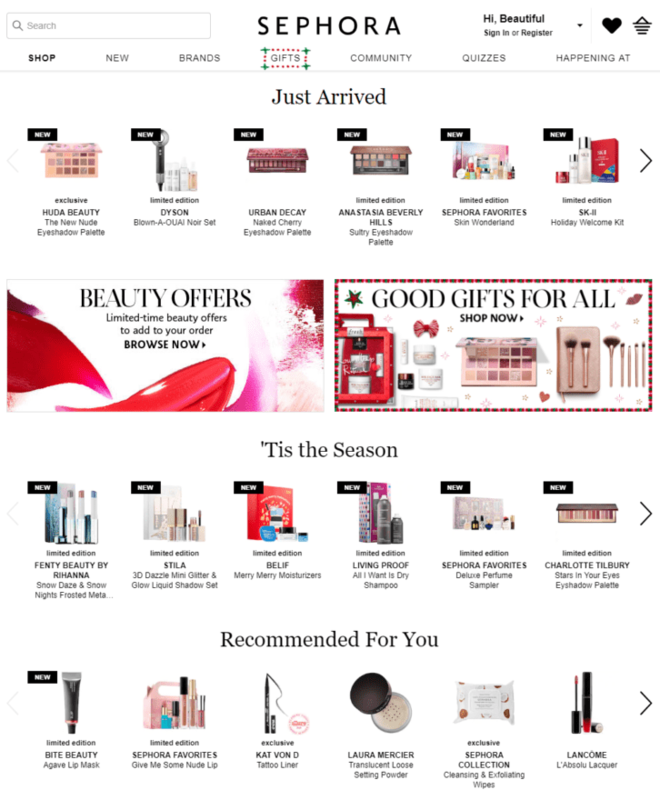 Sephora shows products “Recommended For You” even if you are a new visitor; however, these recommendations are not really personalized. Shopping cart recommendations effectively boost the average order value on your site by cross-selling and upselling complimentary products. Shopping cart recommendations are definitely something website visitors already expect but, at the same time, difficult to implement well with most recommendation engines. The simplest way to benefit from shopping cart recommendations is to show generic, inexpensive products that most people know and use, such as socks, screen wipes, or pillowcases, depending on your line of business. This is the equivalent of the checkout counter items you see in brick-and-mortar stores: chocolate bars, batteries, and – yes – socks. In the shopping cart, Lindex recommends some very generic accessories that can be easily added to the cart. In brick-and-mortar stores, you can also encounter a sales clerk reminding you to buy complementary products, such as an HDMI cable for your brand-new smart TV. You can take the same level of customer service to your webshop by recommending these highly specialized accessories in the shopping funnel. With shopping cart recommendations, it’s important to remember two things. First, recommend the right thing at the right time. Let the visitor proceed far enough in the funnel and only show complimentary products when the purchase decision has been made. Secondly, don’t disturb the purchase flow. 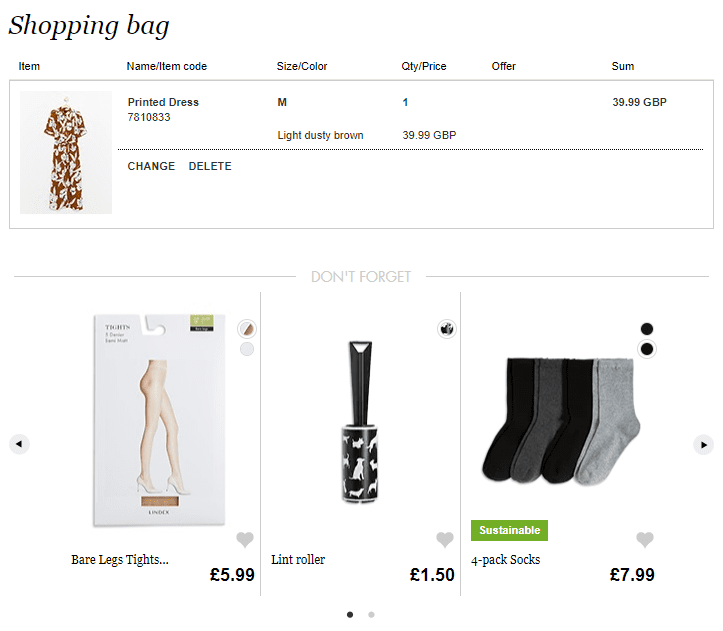 Show products that the visitor can add to the shopping cart without having to view details about colors, sizes, or compatibility with other products. The most effective recommendations are often based on combining different data sources and recommendation types. Many businesses already build their entire webshop on recommendations, that is, ranking and grouping products based on different filters. This approach lets you both personalize content for individual visitors and highlight products you want to promote. You can combine, for example, the visitor’s purchase history, default products, most sold products, and products related to the ones the visitor has recently viewed. And don’t forget to use different models for first-time visitors and regulars. For the best effect, in addition to recommendations, let your visitors take control by providing them with filters they can use to customize the product catalog even further. Eventim shows recommendations by category, combining similar events and showing ratings given by other visitors. Our brand-new add-on feature, Frosmo Recommendations, is designed to address the pain points discussed above: lack of visibility for and control over recommendation algorithms; having unusable or outdated data in multiple separate systems; and problems with personalizing for new visitors. In addition, you can trigger recommendation displays based on basically any event or visitor action on a page, and implement your site’s look and feel to the recommendations to create a seamless user experience. The first version of Frosmo Recommendations will be rolled out in the beginning of December. We are currently testing the beta version with selected customers. In case you’re interested in testing (and providing input for feature development), contact our Sales team! For more information, watch our 40-minute webinar on Frosmo Recommendations. You can also check out recommendations ebook. Katri Metsävuo has a vast experience in technical communication. She’s an expert in translating “developer” into “marketing” and the other way around. During her two years at Frosmo, she has built a technical documentation library from scratch and gotten herself involved in every aspect of platform documentation from UI copy to training materials. 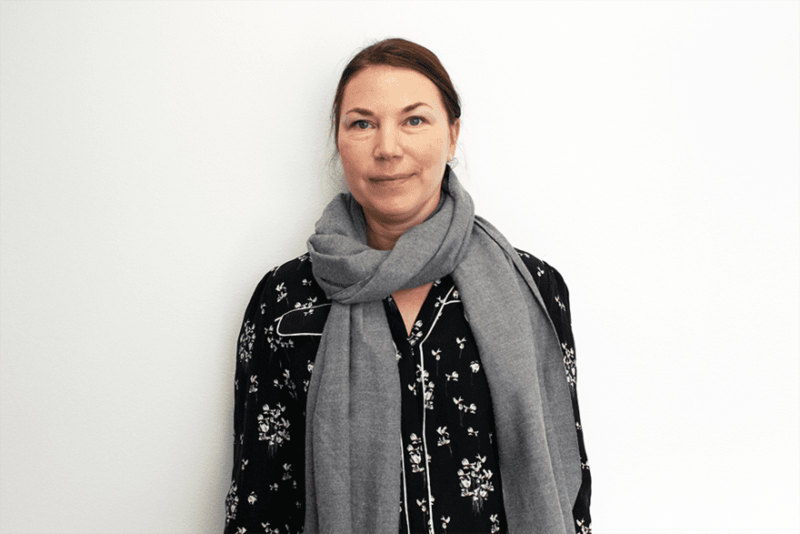 Katri advocates for better digital experiences which she believes are achieved by providing high-quality content that is carefully personalized for each and every visitor.